An exhibition may be broadly defined as a trade fair where various companies can showcase and demonstrate their newly launched and existing products in order to highlight their positive features to prospective customers. In an age where how well a product is marketed and campaigned about largely determines its commercial success, exhibitions are some of the major ways manufacturers and dealers can extensively market about their newly launched products. Unlike retail shops where products can be demonstrated only to a limited number of customers and prospective clients, since in an exhibition people from different regions all around a center come to view the products the number of visitors checking a company’s products is significantly higher. In today’s corporate world of cut-throat competition, having a cutting edge over competitors within the same field is one of the most important tasks for a company to achieve. 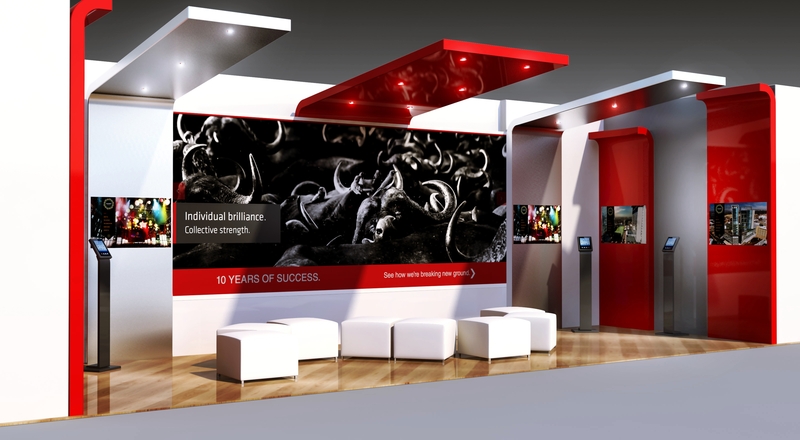 In an exhibition since numerous companies come together in order to market their products, designing and presenting resources and products in a unique, individual way in order to attract the attention of prospective clients is one of the major jobs before a company. Apart from manufacturing products marked with their own unique selling points (USP), they have to be presented at a trade fair in a manner most likely to catch the consumer’s eyes. For this reason, right from the basic structure of their exhibition stands to the smallest details of the interiors a company has to establish its stand in a unique way. While some companies assign their own creative departments to look into these designing matters, others often hire professional architects and interior designers for setting up their exhibition stands. Pictured below are our 3D artist impressions of the designs which showcases these ideas – Six interactive AR panels supported by iPad devices beam relevant products to the viewer via WiFi connections, whilst the central feature becomes the large 4m LED video wall to showcase brand specific imagery and videos. 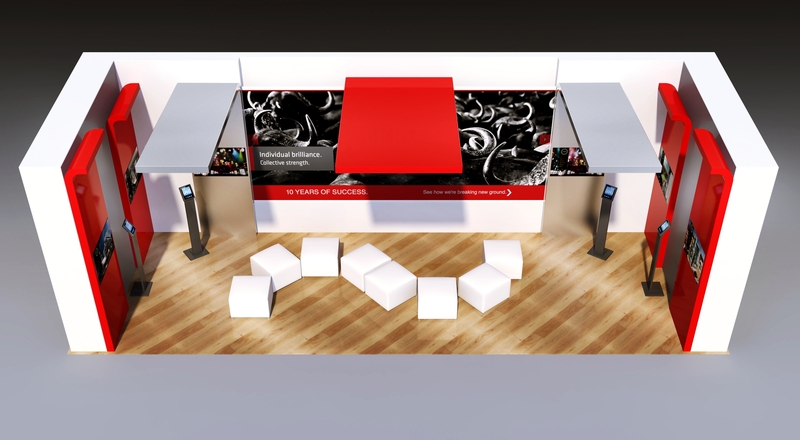 Interior designers dealing with setting up of exhibition stands usually operate in a series of successive steps. Once the basic design of an exhibition stand is decided upon, the infrastructure is set up in such a way that basic features like electric and water lines as well as safety measures and emergency exits are securely implemented. Workers then construct the outer structure out of the desired materials. Keeping the presentation factor in mind features like layout, shape, form and overall appearance are given primary importance while designing and setting up an exhibition stand. In order to attract the potential clientele some companies ask their architects and interior designers to implement various graphics and audio-visual features in their exhibition stands, others use various lighting schemes in order to create the desired atmosphere and interior environment. Companies may also opt for making proper arrangements for their customers to sit and relax and also arrange for various hot and cold beverages to be offered to their visiting clientele. In order to make construction and other arrangement-making processes an easier job, many companies today like to buy ready-made exhibition set-up schemes directly from service providers. From carpets and walls to lightings and power points most of these packages include a large number of features. Although these packages make construction and set up of exhibition stands an overall easier job, since they are available ready-made at the market they can be accessed by a large number of companies at the same time. This not only loses the individual touch from a company’s exhibition stand get-up but also by making it no different from numerous others around, it loses the power of attracting prospective customers. With the current trends where individuality matters most and caters best, the best bet for a company wanting to make its mark would be to employ professional designers for designing the structure and get-up of its exhibition stand. Most exhibition contractors, today, operate via small teams of interior designers who, once a project is explained to them, step by step implement all the details until the exact requirement is met. A company should first analyze its own unique motives and goals and based on these fundamental factors should design a plan with the help of exhibition contractors and designers. The basic layout of the whole project should be designed in such a way that the company’s individual goals are well met and simultaneously products are presented in a way best suiting the customers’ requirements. Whereas, some companies opt for building double-storey stand structures for better overall view, others prefer to keep theirs single storey. As in other business dealings, in designing, structuring and carrying out an exhibition also the company should focus on simultaneously satisfying their customers and maximizing their financial profits and goodwill. Keeping all these factors in mind, deals should be settled with exhibition contractors for designing a company’s exhibition stands. Once the specific requirements of a company are given, most exhibition contractors today, implement their programs by means of a large number of equipments and facilities. From designing the primary layout drawings and digitally preparing 3D CAD visualizations in full colors to detailing all the lighting, graphics and finishing touches exhibition contractors go about implementing their works in a series of meticulous steps. From constructing stands out of quality materials licensed by local regulations to installing fully functioning electric, telephone, internet, fax, water and waste lines, all necessary works are performed by exhibition contractors by their extremely efficient installation teams.